Writing a good guest post is a great skill which you might need to make your blog successful. However just writing a good quality guest post is not sufficient to gain SEO incentives for your blog. An SEO optimized blog post is far more than that which requires few SEO guidelines to follow while writing a quality guest post. 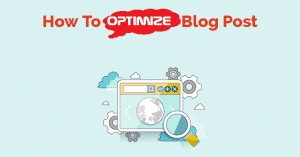 In this article, i am going to discuss few tips to write a SEO optimized blog post for your blog so you can get your blog ranked in search rankings. So here we go. Plan your Post: Before start writing an article for your blog, it is very necessary to plan the agenda of your article first. To write a SEO optimized blog post you can’t pick a random topic and write on that. You will need to plan it first. While choosing a topic for your blog post you must consider keyword also so that you can rank your blog page for that keyword. Here is how keyword research will help you to choose a quality topic for your blog post. Keyword Research: Keyword research is the first phase of writing a blog post. A good blog post is always keyword oriented. People use different long tail keywords in their blog post so that Google can rank site’s article page for those keywords. Keyword research is necessary before start writing your blog post because if you want to rank your article then you must target a keyword in your article. Research Work: After choosing right keyword and topic for your blog post, now it’s time to move on research work. For a great quality blog post it’s very necessary to do some research work first before writing content. For this purpose, you can read other articles available on relevant blogs. If you are writing about any product then you can also search the internet to know about pricing, specifications and other details of the product. Article Structure: A good quality blog post is always written in the good structure. If your article is following a good structure then it will become easy to read and attractive for users. For a simple article, you can divide it into 3 sections. In first section or paragraph, you can explain agenda and purpose of your article. In the second section you can include your research work and other informative material and in the last section, you can conclude your article with a productive outcome. However, if you have a lengthy blog post to write then you can divide it into multiple segments according to your post requirements. Internal Linking: While publishing the article on your blog it’s also very necessary to link it with other relevant articles. This way you can engage your visitors on your site in a better way. Internal linking also helps to flow link juice in your site in an effective way. These are few guidelines which you need to consider while writing an SEO optimized blog post for your blog. If you have written your blog post by following these guidelines then you don’t need any other steps to SEO optimize your blog post. Author Bio: This article is written by Sara Jim, working as marketing manager at Bissmik which is one of the best digital marketing company which provides quality SEO services in Dubai and around UAE.